Our vessels provide a comfortable, spacious venue for any occasion from corporate events – such as staff parties, team building and seminars – as well as birthdays, weddings and any occasion one wishes to celebrate. 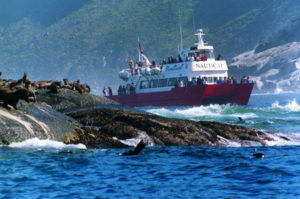 Tickets for our Daily Seal Island Trips are available from our Ticket Office in Hout Bay Harbour. We have a number of standard cruises however we are able to design a cruise to meet your specific requirements. All passengers board the Nauticat or Jester at their own risk and neither the vessel nor the company take any responsibility for any loss or damages to person or property.